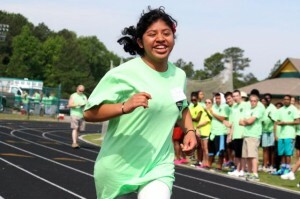 Olinda Hernandez sprints down the track before a crowd of cheering fans Friday at Raider Stadium during the Richmond County Special Olympics Spring Games. 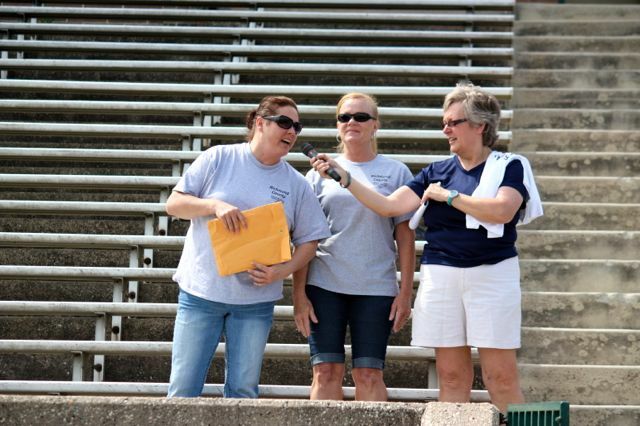 A Richmond County Department of Social Services employee by trade, Brown and a team of fellow DSS workers were converted into volunteers on Friday for the Richmond County Special Olympics Springs Games at Raider Stadium in Rockingham. Opening ceremonies included a torch display, led by Sheriff James Clemmons Jr. and the JROTC honor guard from Richmond Senior High School. That preceded a procession of participating athletes from Cordova School, L.J. Bell Elementary School, Richmond County Ninth Grade Academy, Washington Street School, West Rockingham Elementary School, adults from across Richmond County and residents of adult group homes in Hamlet, Rockingham and Ellerbe, as well as those from host Richmond Senior High School. It was the first time athletes from Ninth Grade Academy and Washington Street School participated in the Spring Games, which was comprised of a tennis ball throw, a sprint on the high school track, Olympic Town and a standing broad jump. Medals were awarded to the top three individuals in each heat for each event. Activities at Olympic Town, situated on the football turf inside the track, was arranged by Project Unify and approximately four dozen students from the Ninth Grade Academy’s Beta Club. Cathy Hoggard, right, accepts a donation of $8,499 from Sarah Thompson, left, and Georgetta Morgan. Thompson and Morgan donated the proceeds from the 5th annual Buddy Roe’s Special Olympics Bike Ride, that took place last Saturday and involved more than 60 bikers. The event was staffed by dozens of volunteers and family members while being organized by Cathy Hoggard, Special Olympics Richmond County coordinator. Hoggard recognized special contributions from recent events, including proceeds from the 5th annual Buddy Roe’s Bike Ride for Special Olympics on Saturday. That event netted $8,499 and brought Hoggard to tears. That money was presented to Hoggard and the athletes and volunteers present by Sarah Thompson and Georgetta Morgan. “That is awesome,” Hoggard said. 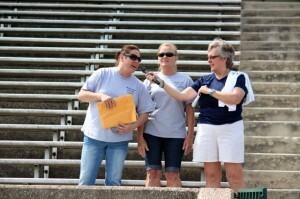 Hoggard called this year’s Spring Games, the largest event of the year for Richmond County Special Olympics, a success. The event was staged with nearly 100 adult and student volunteers, Hoggard said, although a core group of volunteers comprised a committee to plan the day’s events. She plans to schedule an interest meeting to seek additional volunteers in coaching, organization and planning, marketing, fundraising and other areas that would directly benefit the athletes. Anyone interested in volunteering with the group can call Hoggard at 910-895-5946.